Jake Allen stopped the initial shot, but the puck bounced off Jay Bouwmeester and into the net. CHICAGO — The game puck for his first NHL win meant something to Jeremy Colliton. The relief for his players meant a lot more. Colliton got his first victory as an NHL coach when Corey Crawford made 28 saves to help the Chicago Blackhawks beat the St. Louis Blues 1-0 on Wednesday night, stopping an eight-game losing streak. Chicago’s slide began with a 7-3 loss at St. Louis on Oct. 27, and the 33-year-old Colliton took over after Joel Quenneville was fired on Nov. 6. The Blackhawks then dropped his first three games behind the bench before shutting down the Blues in the opener of a three-game homestand. The Blackhawks celebrated by presenting Colliton with a game puck in honor of his milestone win, and then looked forward to adding to his total. “It’s been fun to play for him so far and we know he’s going to have a lot more coming,” captain Jonathan Toews said. St. Louis lost its second straight game after winning four of five. 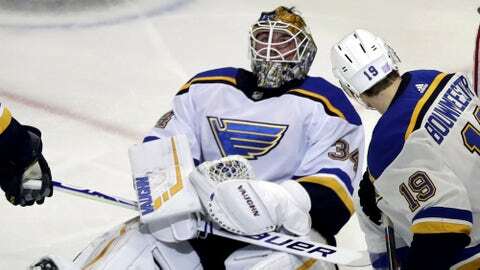 The Blues also dropped to 1-3-0 against the Blackhawks with one game left in the season series on April 3. It was Crawford’s first shutout in more than a year and No. 24 for his career. He missed most of last year and the start of this season because of a concussion. Chicago got the game’s only goal after St. Louis star Vladimir Tarasenko was penalized for hooking in the second period. Toews set up Brent Seabrook for an open look that was stopped by Jake Allen, but Blues defenseman Jay Bouwmeester kicked it into the net at 4:05. Allen was pulled for an extra attacker with 1:14 remaining, and Crawford turned away David Perron’s drive to the net with about 18 seconds left. Allen finished with 18 saves in the opener of a three-game trip. St. Louis center Ryan O’Reilly lost a 10-game point streak. Defenseman Colton Parayko had the best scoring opportunity for the Blues, banging a shot off the inside of the left post in the second. Tarasenko also was denied by Crawford on a 2-on-1 opportunity during a mostly dull opening period. NOTES: Blues C Brayden Schenn missed his fourth consecutive game with an upper-body injury. … Blackhawks F Brandon Saad returned to the lineup after missing two games with a right arm injury. … Blues D Jordan Schmaltz, the brother of Blackhawks F Nick Schmaltz, was scratched. … Blackhawks D Duncan Keith played in his 1,014th game, snapping a tie with Eric Nesterenko for fourth on the franchise list. … D Gustav Forsling made his first appearance with Chicago this season. Forsling was recalled from the minors when the Blackhawks placed F Marcus Kruger (left leg) on injured reserve on Tuesday. … Blackhawks D Brandon Davidson was sidelined by a right leg injury. He has played in just seven games this season. Blues: Visit the Vegas Golden Knights on Friday night. Blackhawks: Host the Los Angeles Kings on Friday night.